A huge goal for me this year is to document my own family. I sat down just before Christmas to order prints for the grandparents and I didn’t really have anything worth printing. I had gone an entire year without a formal planned session of my own children. My big girl camera had stayed in it’s bag the majority of the time I was at home, only coming out to photograph my clients. I only had iPhone pictures and while they are certainly printable, they weren’t portrait worthy. To help me with my goal, I’ve joined a group lead by one of my favorite people, Carey of Images by Carey Pace . 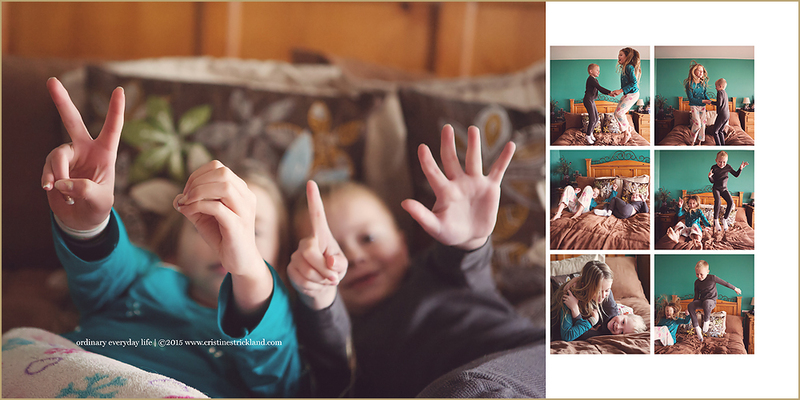 Carey and I have been friends for a few years and I admire her ability to capture her family in the every day. It’s so pure and unplugged and real. I’m a pretty private person. I don’t show family life in public much so participating in this is a pretty big deal for me and posting it publicly is even bigger. As a group, we’ll post a single image depicting the weeks theme. While it’s a Facebook group, a lot of them will be posted on Instagram with the hashtag #ordinaryeverydayP52. Mine will have the additional tag of #52weeksofstrickland. In the end, I hope to have a 52 spread coffee table book documenting 2015. Every week I hope to post a page from our book here on the blog. This entry was posted in personal | Bookmark the permalink. This is so awesome. Love the ready-made book idea. I’ve been trying to hard to print pics but came up empty-handed for family gifts this year. Grandparents got an empty 8 x 10 frame with the promise to fill it with a pic from our upcoming family session. Pathetic!